AWE's exhausts have earned praise from owners and the press alike, due to their unique "Jekyll and Hyde" personality. AWE spends considerable time and effort during development to achieve remarkable civility when idling and cruising at part throttle, while also producing a war-cry wail when full throttle is applied. Sophisticated, refined, and powerful, all at once. AWE also spent considerable time examining how to maximize the performance and options of this exhaust system. The factory exhaust consists of a long downpipe with two catalytic converters, and two rather large mufflers in the section after the cats. Thorough long term street testing has confirmed that our high flow downpipe will not set a Check Engine light or any fault codes in the ECU. The downpipe features an integrated resonator to keep the exhaust sound volume civilized even with the elimination of the very restrictive factory converters. Our downpipe is the first performance downpipe to be released that will not trigger a Check Engine Light on TSI 2.0T cars, even on factory software. The catback system is topped off with your choice of 102mm Slash Cut Tips available in Chrome Silver or a luscious Diamond Black finish. The tips sport laser etched AWE Tuning logos and are double walled to ensure a mirror polish even under hard usage. The system has multiple slip joints with high quality stainless band clamps, to allow optimal adjustment. Why did AWE choose 2.5 inch and not 3.0 inch diameter for their MK6 exhaust? The first 2.0T exhaust prototypes were indeed 3.0 inch, but we found that the effort it took to move the large mass of air in the 3.0 inch system at lower rpms resulted in a loss of torque with very little offsetting gain up top. 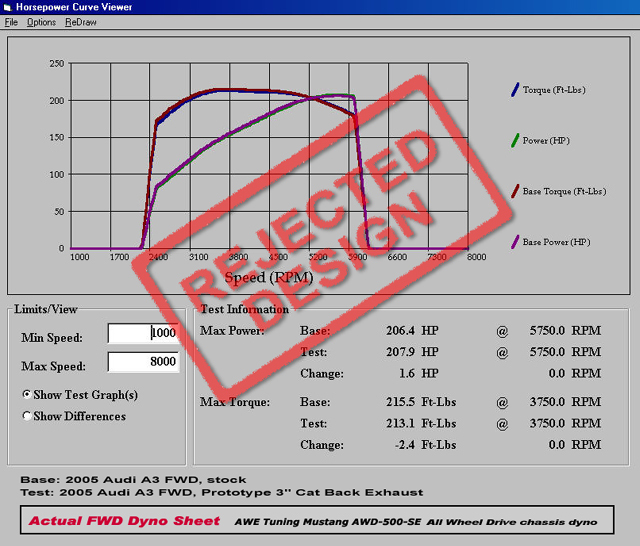 Take a look at their 3.0 inch prototype dyno sheets here and see why a 3.0 inch system is not appropriate for this car. Please note that due to the use of high flow catalytic converters, the downpipe section is legal only for racing vehicles which may never be used upon a highway. Please note: Downpipe is not included unless selected as an option above.